Franklin is inspired by the magic of possibility and discovery found in the small-town libraries of Denyse's native New England. Combining the comfort of the familiar with excitement of new ideas and places, Franklin transports and trancends with the timelessness of our best-loved classics. Nostalgic calicos, stripes, and geometrics are reminiscent of beautiful end papers – and elegant, wise librarians. Franklin's library is the oldest (1790) public library in the US and houses a collection of books donated by the town's namesake, Benjamin Franklin. Denyse's mom (who taught her to sew) visited her local library every week, without fail, creating a lasting and deep influence on her daughter! 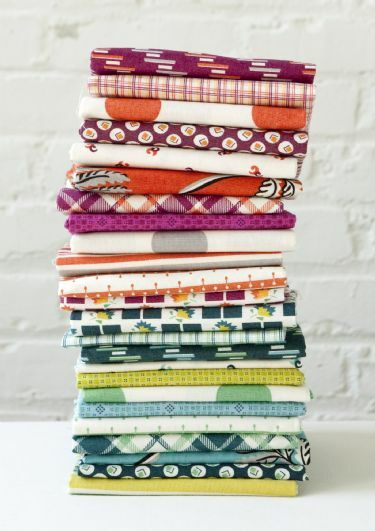 Franklin pre-cut bundles feature coordinating selections from Denyse's Modern Solids! Franklin 10-inch Charm Bundle, $38 plus shipping.